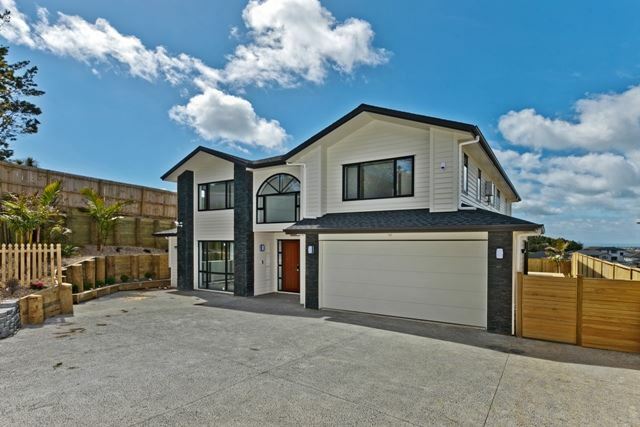 Fantastic executive home finished to exceptional standards, and designed with all the family in mind. Beautiful and spacious modern open plan kitchen/dining with wooden flooring flows to large deck with landscaped grounds and lawn, with rolling urban views to the city and sky tower. Downstairs includes a separate formal living room, garage access, storage, plus a 2 bedroom with living area wing with separate deck access - perfect for a granny set up arrangement. Ascend the beautiful wooden staircase to a level which is beyond belief with additional living space, and with each bedroom including walk in robes and their own ensuite! The master includes access to its own deck, and super sized ensuite with double vanity and bath. A separate study room, or could be used as a nursery is also included in one of the bedrooms. Fully fenced and with top security for peace of mind. Nestled amongst high quality homes in a great location for motorway access, this really is practical perfection not to be missed!